Spencer Compton Cavendish, 8th Duke of Devonshire, KG, GCVO, PC, PC (Ire), FRS (23 July 1833 – 24 March 1908), styled Lord Cavendish of Keighley between 1834 and 1858 and Marquess of Hartington between 1858 and 1891, was a British statesman. He has the distinction of having served as leader of three political parties: as Leader of the Liberal Party in the House of Commons (1875–1880) and as of the Liberal Unionist Party (1886–1903) and of the Unionists in the House of Lords (1902–1903) (though the Conservatives and Liberal Unionists operated in close alliance from 1892–1903 and would eventually merge in 1912). He also declined to become Prime Minister on three occasions, not because he was not a serious politician but because the circumstances were never right. Devonshire was the eldest son of William Cavendish, 2nd Earl of Burlington, who succeeded his cousin as Duke of Devonshire in 1858, and Lady Blanche Cavendish (née Howard). Lord Frederick Cavendish and Lord Edward Cavendish were his younger brothers. He was educated at Trinity College, Cambridge, where he graduated as MA in 1854, having taken a Second in the Mathematical Tripos. He later was made honorary LLD in 1862, and as DCL at Oxford University in 1878. In later life he continued his interests in education as Chancellor of his old university from 1892, and of Manchester University from 1907 until his death. He was Lord Rector of Edinburgh University from 1877 to 1880. After joining the special mission to Russia for Alexander II's accession, Cavendish entered Parliament in the 1857 general election, when he was returned for North Lancashire as a Liberal (his title "Lord Hartington" was a courtesy title; as he was not a peer in his own right he was eligible to sit in the Commons until he succeeded his father as Duke of Devonshire in 1891). Between 1863 and 1874 Hartington held various Government posts, including Civil Lord of the Admiralty and Under-Secretary of State for War under Palmerston and Earl Russell. In the 1868 general election he lost his seat; having refused the Lord Lieutenancy of Ireland, he was made Postmaster-General, without a seat in the Cabinet. The next year he re-entered the Commons, having been returned for Radnor. In 1870 Hartington reluctantly accepted the post of Chief Secretary for Ireland in Gladstone's first government. In 1875 — the year following the Liberal defeat at the General Election — he succeeded William Ewart Gladstone as Leader of the Liberal opposition in the House of Commons after the other serious contender, W. E. Forster, had indicated that he was not interested in the post. The following year, however, Gladstone returned to active political life in the campaign against Turkey's Bulgarian Atrocities. The relative political fortunes of Gladstone and Hartington fluctuated — Gladstone was not popular at the time of Benjamin Disraeli's triumph at the Congress of Berlin, but the Midlothian Campaigns of 1879–80 marked him out as the Liberals' foremost public campaigner. In 1880, after Disraeli's government lost the general election, Hartington was invited by the Queen to form a government, but declined — as did the Earl Granville, Liberal Leader in the House of Lords — after William Ewart Gladstone made it clear that he would not serve under anybody else. Hartington chose instead to serve in Gladstone's Second government as Secretary of State for India (1880–1882) and Secretary of State for War (1882–1885). In 1884 he was instrumental in persuading Gladstone to send a mission to Khartoum for the relief of General Gordon, which arrived two days too late to save him. A considerable number of the Conservative party long held him chiefly responsible for the "betrayal of Gordon." His lethargic manner, apart from his position as war minister, helped to associate him in their minds with a disaster which emphasized the fact that the government acted "too late"; but Gladstone and Lord Granville were no less responsible than he. The Duke of Devonshire by Sir Hubert von Herkomer. Hartington became increasingly uneasy with Gladstone's Irish policies, especially after the murder of his younger brother Lord Frederick Cavendish in Phoenix Park. After being elected in December 1885 for the newly created Rossendale Division of Lancashire, he broke with Gladstone altogether. He declined to serve in Gladstone's third government, formed after Gladstone came out in favour of Irish Home Rule (unlike Joseph Chamberlain, who accepted the Local Government Board but then resigned), and after opposing the First Home Rule Bill became the leader of the Liberal Unionists. 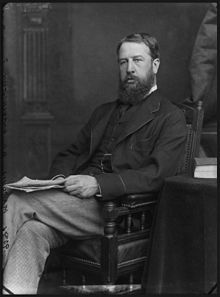 After the general election of 1886 Hartington declined to become Prime Minister, preferring instead to hold the balance of power in the House of Commons and give support from the back benches to the second Conservative government of Lord Salisbury. Early in 1887, after the resignation of Lord Randolph Churchill, Salisbury offered to step down and serve in a government under Hartington, who now declined the premiership for the third time. Instead the Liberal Unionist George Goschen accepted the Exchequer in Churchill's place. I venture to express the opinion that [Chamberlain] will find among the projects and plans which he will be called upon to discuss none containing a more Socialistic principle than that which is embodied in his own scheme, which, whether it can properly be described as a scheme of protection or not, is certainly a scheme under which the State is to undertake to regulate the course of commerce and of industry, and tell us where we are to buy, where we are to sell, what commodities we are to manufacture at home, and what we may continue, if we think right, to import from other countries. Balfour, trying to juggle different factions, had allowed both Chamberlain and Free Trade supporters to resign from the government, hoping that Devonshire would remain for the sake of balance, but the latter eventually resigned under pressure from Charles Thomson Ritchie and from his wife, who still hoped that he might lead a government including leading Liberals. But in the autumn of 1907 his health gave way, and grave symptoms of cardiac weakness necessitated his abstaining from public effort and spending the winter abroad. He died, rather suddenly, at Cannes on 24 March 1908. He served part-time as Captain in the Duke of Lancaster's Own Yeomanry from 1855 to 1873, and was Honorary Colonel of the 3rd (Militia) Battalion of the Derbyshire Regiment from 1871 and of the 2nd Sussex Artillery Volunteers from 1887. Hartington took great pains to parade his interest in horseracing, so as to cultivate an image of not being entirely obsessed by politics. For many years the courtesan Catherine Walters ("Skittles") was his mistress. He was married at Christ Church, Mayfair, on 16 August 1892, at the age of 59, to Louisa Frederica Augusta von Alten, widow of the late William Drogo Montagu, 7th Duke of Manchester. Upon his death, he was succeeded by his nephew Victor Cavendish. He died of pneumonia at the Hotel Metropol in Cannes and was interred on 28 March 1908 at St Peter's Churchyard, Edensor, Derbyshire. A statue of the Duke can be found at the junction of Whitehall and Horse Guards Avenue in London, and also in the Carpet Gardens at Eastbourne. Upon receiving news of the Duke's death, the House of Lords took the unprecedented step of adjourning in his honour. Margot Asquith said the Duke of Devonshire "was a man whose like we shall never see again; he stood by himself and could have come from no country in the world but England. He had the figure and appearance of an artisan, with the brevity of a peasant, the courtesy of a king and the noisy sense of humour of a Falstaff. He gave a great, wheezy guffaw at all the right things and was possessed of endless wisdom. He was perfectly disengaged from himself, fearlessly truthful and without pettiness of any kind". Historian Jonathan Parry claimed that "He inherited the whig belief in the duty of political leadership, afforced by the intellectual notions characteristic of well-educated, propertied early to mid-Victorian Liberals: a confidence that the application of free trade, rational public administration, scientific enquiry, and a patriotic defence policy would promote Britain's international greatness—in which he strongly believed—and her economic and social progress...he became a model of the dutiful aristocrat". It has been said[according to whom?] that he was "the best excuse that the last half-century has produced for the continuance of the peerages". With 24 years of government service, Devonshire's is the fourth longest ministerial career in modern British politics. ^ a b "Cavendish, Spencer Compton, Lord Cavendish (CVNS850SC)". A Cambridge Alumni Database. University of Cambridge. ^ Chisholm 1911, pp. 131–132. ^ a b Chisholm 1911, p. 131. ^ The Fiscal Question, HL Deb 22 February 1906 vol 152 cc456-86. ^ Kelly's Handbook of the Titled, Landed and Official Classes, 1895. Kelly's. p. 368. ^ Hansard, THE LATE DUKE OF DEVONSHIRE HL Deb 24 March 1908 vol 186 cc1178-83 . ^ Margot Asquith, The Autobiography of Margot Asquith. Volume One (London: Penguin, 1936), p. 123. ^ Parkinson, Justin (13 June 2013). "Chasing Churchill: Ken Clarke climbs ministerial long-service chart". BBC News. This article incorporates text from a publication now in the public domain: Chisholm, Hugh (1911). "Devonshire, Earls and Dukes of" . In Chisholm, Hugh (ed.). Encyclopædia Britannica. 8 (11th ed.). Cambridge University Press. pp. 130–132. Rempel, Richard A. Unionists Divided: Arthur Balfour, Joseph Chamberlain and the Unionist Free Traders (Archon Books, 1972). Wikimedia Commons has media related to Spencer Cavendish, 8th Duke of Devonshire. "Archival material relating to Spencer Cavendish, 8th Duke of Devonshire". UK National Archives.